ALICE STOFEN (1914) The 18 ton 40 foot schooner Alice Stofen stranded and was lost at Herschel Island, Arctic Ocean August 16, 1914. The two persons aboard the vessel made it to safety. AMARANTH (1913) On August 30, 1913 the 1109 ton, four masted barkentine Amaranth wrecked at Jarvis Island and became a total loss. AMY D (1962) The 23 ton 41 foot steel oil screw fishing vessel Amy D foundered August 22, 1962 at Mallard Bay. ANNA HELEN (1930) At 7:00 in the evening on November 25, 1930 the wood oil yacht Anna Helen caught fire from an undetermined cause, eight miles west of Seymour Narrows in Discovery Passage, and was lost. Her four crewmen made it to safety, but the yacht, valued at $40,000 became a total loss. She had been on a trip from Seattle to Alaska when the accident occurred. ANNA J (1935) At 1:00 in the morning the American oil screw halibut fishing vessel Anna J was rammed by the overtaking vessel British S S Prince Rupert near Maud Island, Seymour Narrows, British Columbia. The Anna J had left Vancouver with her crew of 6 on a halibut fishing trip August 24th and had nine tons or $1,800 worth of fresh halibut on board. 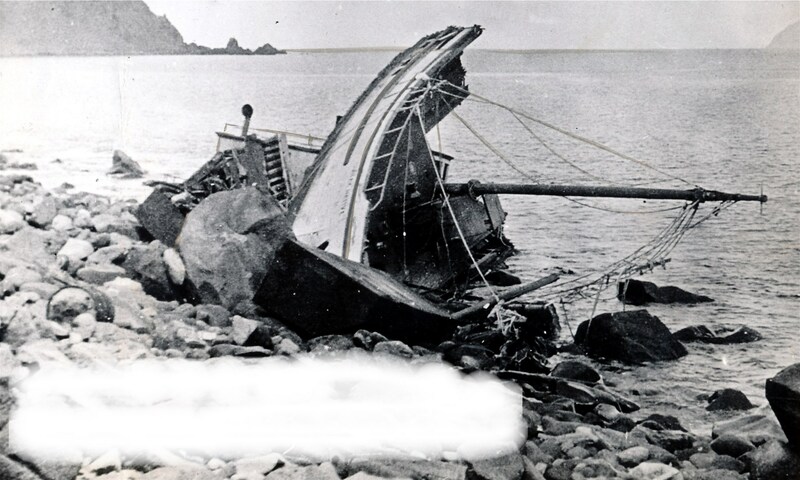 In the casualty report filed by the vessel’s master and owner, Edward Lawler of Seattle, the vessel (valued at $15,000) and her cargo were a total loss. Only the cargo was insured. Lawler remarked that it was a starlit night with only a gentle breeze blowing when the collision took place. He had endeavored to stay as close to shore as possible. The tug boat Cape Scott of Vancouver was able to render some assistance. ANNIE (1889) The 42 ton 57 foot wooden schooner Annie disappeared with all hands after leaving San Francisco February 9, 1889 bound for Unalaska with 11 crewmen aboard. The 81 foot schooner Otter and 82 foot schooner James A Hamilton left out of San Francisco March 2, 1889 and disappeared on the same route, also losing all hands. Lost with the Annie were: Captain – John Johnson, Mate – John Brown, Hunters – Gustave Gimmel and Joseph L Dupont, Seamen – James Smith, Peter Norman, Martin Cremes, Keimpe Kornes, Juqoat Krestauson and Robert Turner, Cook – Roger Augustine. The Annie was valued at $3,000 at the time of the disaster. ANYO MARU #1 (1999) The 190 foot Japanese trawler Anyo Maru #1 foundered in rough weather December 9, 1999 in the Bering Sea 120 nautical miles south of Cape Navarin, Russia and 180 miles west of Saint Mathew Island in the Pribilof Islands. 12 crewmembers were lost and 24 rescued. ARCTIC (1910) In September of 1910 the vessel Arctic was lost off Cape Douglas. Mapping and Location: There is a Cape Douglas along the northeast coast of the Alaska Peninsula at 58 51 N 153 15 W. There is a second Cape Douglas on the Bering Sea 51 miles northwest of Nome at 65 N 166 42 W.
ARIES (1974) The 86 foot steel crab fishing vessel Aries sank west of Anderson Island, British Columbia September 19, 1974. The 1971 Tacoma vessel had just been modified to fish crab for Pan Alaska and was traveling from Tacoma to the Juneau area. Skipper Vito Kalcic of Kodiak was filling the forward crab tank when a bulkhead gave way flooding aft. All five crewmembers escaped to a liferaft as Aries vessel sank stern first. They were rescued by a Canadian fishing vessel and transported to Tolfino, B.C. ARILLA (1900) The 107 ton two masted schooner Arilla was reported lost in Alaskan Waters in 1900. Comment: There is evidence of a vessel of the same tonnage and name built in 1899 at Port Angeles. I have seen newspaper references to it in 1901 still in operation. ATKA QUEEN (1973) The 105 foot crab fishing vessel Atka Queen sank on her maiden voyage from Puget Sound to Dutch Harbor in October of 1973. All five crewmen were rescued by the U S Coast Guard near the Strait of Juan de Fuca.